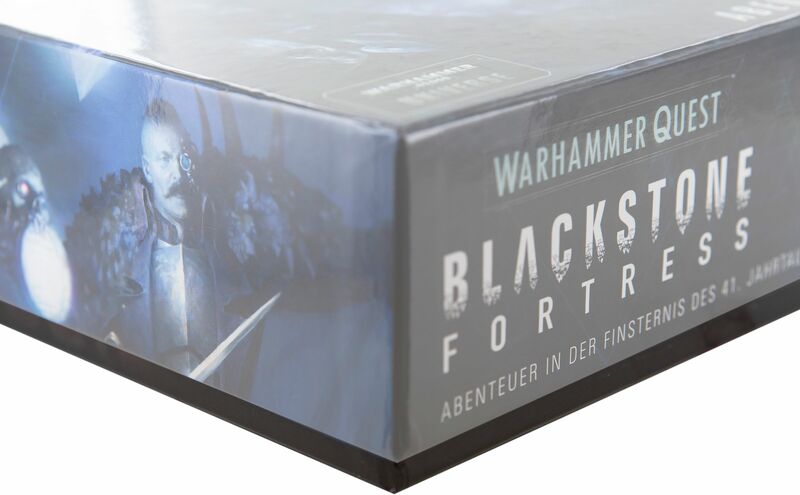 In this age of darkness, in a galaxy plagued by strife and terror, the Black Fortress is the last hope to turn the tide of war. Thus, the brave and the desperate alike enter the labyrinth-like halls of this ancient space station in search of long lost, powerful technologies. The game is packed to the brim with wonderful, detailed miniatures and plenty of game material. 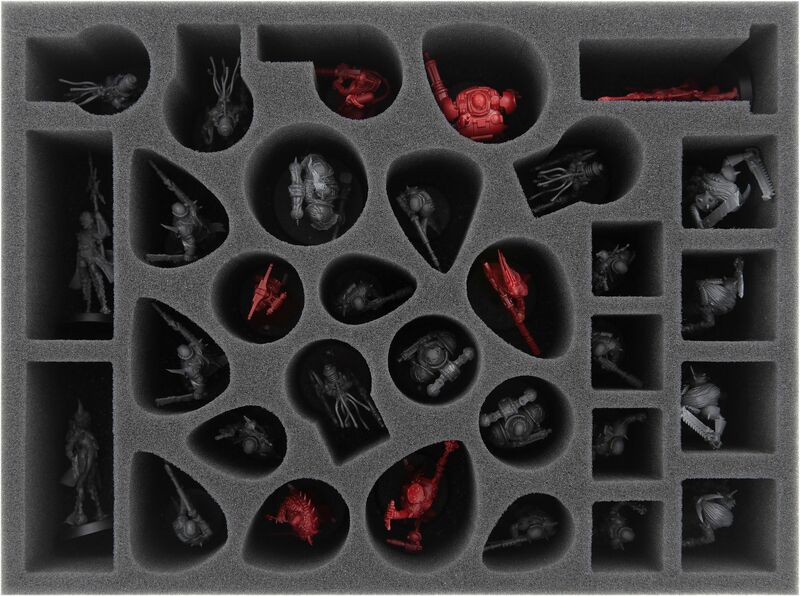 So that your box does not become a labyrinth itself and the figures lose themselves in the darkness, we have the suitable foam tray set for you here. 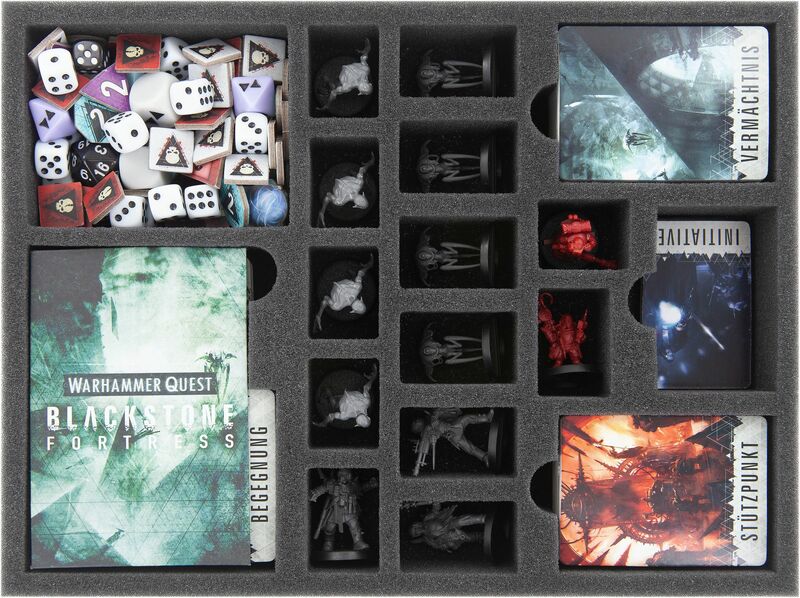 The set fits exactly into the original Games Workshop board game box for 'Warhammer Quest: Blackstone Fortress'. Two foam inserts provide order, protection and overview in your box. 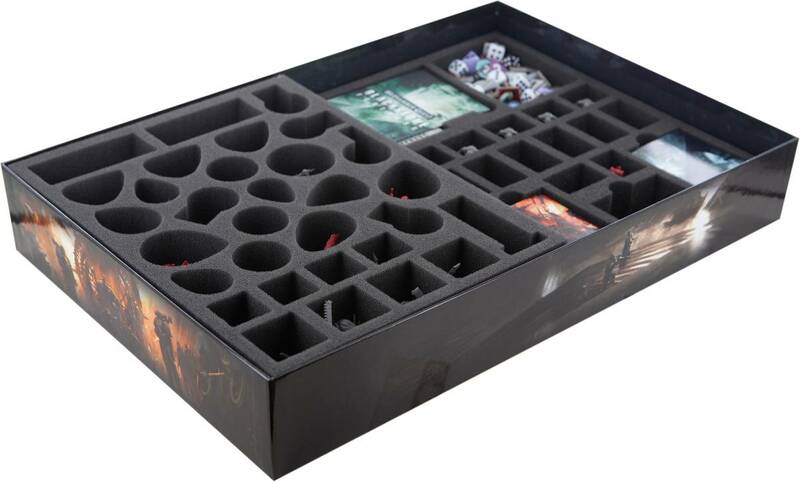 A 65 mm high tray is divided into 31 compartments, which are individually tailored to the Explorer and Hostiles miniatures. Wrapped in soft foam, the finely detailed figures are optimally protected from damage, so that Amallyn Shadowguide can continue to target the hostiles with her Ranger long rifle. You also don't have to worry about painted models anymore. The tray prevents them from slipping around or colliding with each other, which might ruin hours of painstaking painting. The colors remain intact and free of scratches. The second mat takes care of the remaining 13 models. Rein's sniper rifle is as safe as Raus' climbing hook, and the claws of the Ur-Ghul remain dangerously sharp. 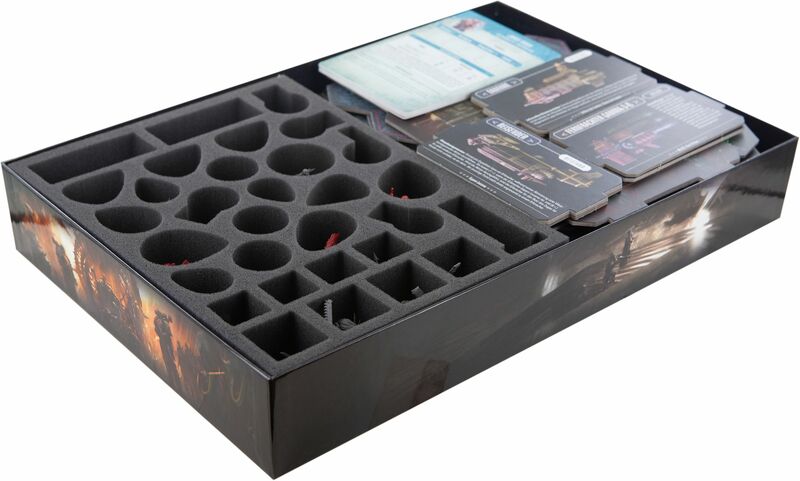 5 additional compartments help you to organize the game material. A large one is for storing the counters and markers, as well as the dice. For the game cards you have 4 compartments at your disposal. The large sized one for the exploration cards can also hold the encounter cards, thanks to the additional recess. The compartments are all provided with finger-wide recesses for easy removal of the stacks. Finally, there is a suitable foam topper on each insert so that the miniatures are completely surrounded by foam. On the lower mat for the game material there is still enough space to place the tiles, the Precipice board with the spacecraft. Upon the foam toppers, you also place the Explorer and Hostile cards, the database and the hidden vault envelope, the combat track as well as the line-of-sight ruler, along with the booklets. 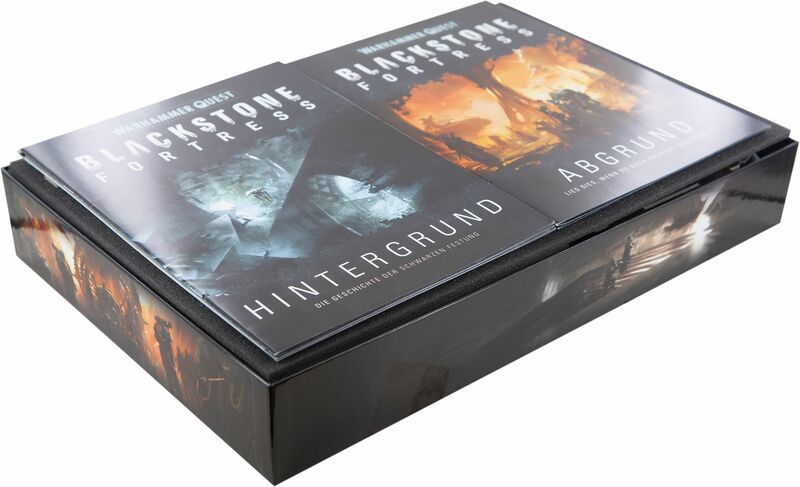 Hereby, all 44 miniatures are safely stored, all the game material is neatly stowed away and the contents of your box are optimally protected, even on the bumpiest routes to the next expedition. CMMEIO065BO: 285 mm x 212,5 mm x 65 mm total height (57 mm usable height + 8 mm foam base). CMMEIN040BO: 285 mm x 212,5 mm x 40 mm total height (32 mm usable height + 8 mm foam base).